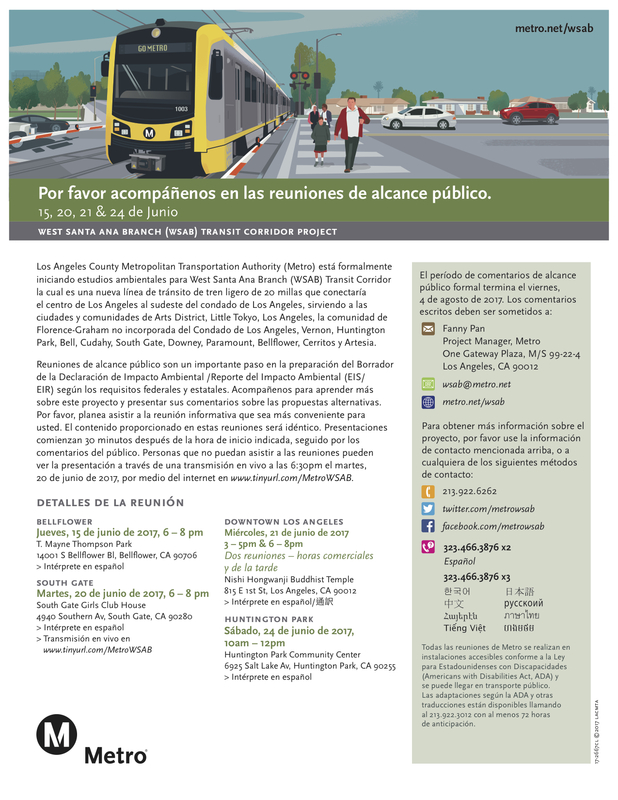 The passage of Measure M last year helped provide needed funding for an important Metro project: a light rail line between Artesia and Union Station that would serve several other cities and communities in the southeast part of L.A. County, known as the West Santa Ana Branch Transit Corridor. Some early planning studies have already been done. Now Metro is kicking off the more comprehensive and thorough Draft Environmental Impact Statement/Environmental Impact Report (EIS/EIR), which will analyze key topics related to the project alternatives. 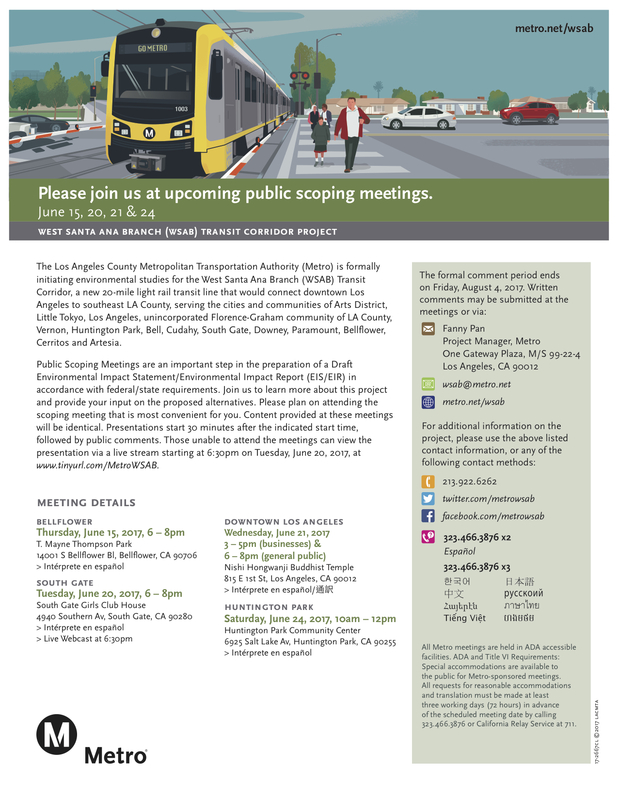 As part of that process, Metro is holding four community meetings this month to go over the project alternatives and receive and document public input as part of the environmental document. An extended public scoping comment period is open from June 6 through August 4. Meeting times and dates are below. Please note that the meeting on Tuesday, June 20, will be live webcast. Even if you can’t watch it live, there will be a version available for later viewing on metro.net. There is also a lot more information about on the project website, including how to submit a comment. Under the Measure M expenditure plan, the project is expected to begin construction as early as 2022. Metro is also exploring public-private partnerships to accelerate construction of the project. Also, here is a report from this April on the alternatives for the northern part of the project. So what’s the rationale for light rail instead of just continuing the red line south through those areas? Isn’t this route relatively high density? The subway is considered ‘heavy rail’ and gets its power from a third rail at ground level. For that reason, Metro (and other agencies) usually build heavy rail only when it’s entirely underground or entirely separated from the street. That’s extremely expensive. Light rail, on the other hand, can be built at street level although there are often underpasses, bridges, etc. Pure stupidity, building another light rail line parallel to the Blue Line either along the same right of way but separate tracks or less than one mile away. One excuse is the former LACTC which was merged with the RTD, a true operation agency as opposed to the MTA, screwed up when they built the Blue Line. We already know they failed to build it to american light rail standards instead using a alternate Japanese standard that has now had to be rebuilt over the past year to those american standards. Meanwhile there is no plans to build a light rail line along one of the Los Angeles areas busiest traveled corridors from Downtown Los Angeles to Santa Monica via Santa Monica Bl. and Sunset Bl. The west side was developed with the extension of the Highway Two Freeway being completed which was planed post WW2 only to be killed by Governor “Moonbeam” although the exact route had been adopted and property acquired. Where did the money go that was taxed and the interest accumulated these passed years budgeted for the”Two Project?” It’s time the MTA gets it’s priorities in line with the needs of the entire community instead of special interests it seems tied to. Yes, there is the Purple Line under construction and the Expo Line but both are miles away with few bus connections especially west of LaCienega where there is no north – south bus service until Westwood Bl and Sepulvada Bl. then none clear to the beach. Compare this to the proposed Artisia Light Rail Line. There are east-west service along every major street connecting to the Blue Line. And streets running north and south adjacent to the proposed line do not experience the hours of gridlock one experiences fallowing the proposed route two that was killed although massive construction continues even currently including Century City with no relief in sight. Is there any notable difference in having it on the blue line vs separate? The ridership is was concerns me most. Is there densite there for this. I like the separate ones but wish the arts district station was on them. It would be a great mistake to share the blue line track between Slauson and Washington. This is a huge recipe for delays, even if the tracks are completely grade-separated (like BART). But we don’t have grade separation on the lines in question — as we all know, these lines share street traffic and can be delayed even by a crosswalk signal. 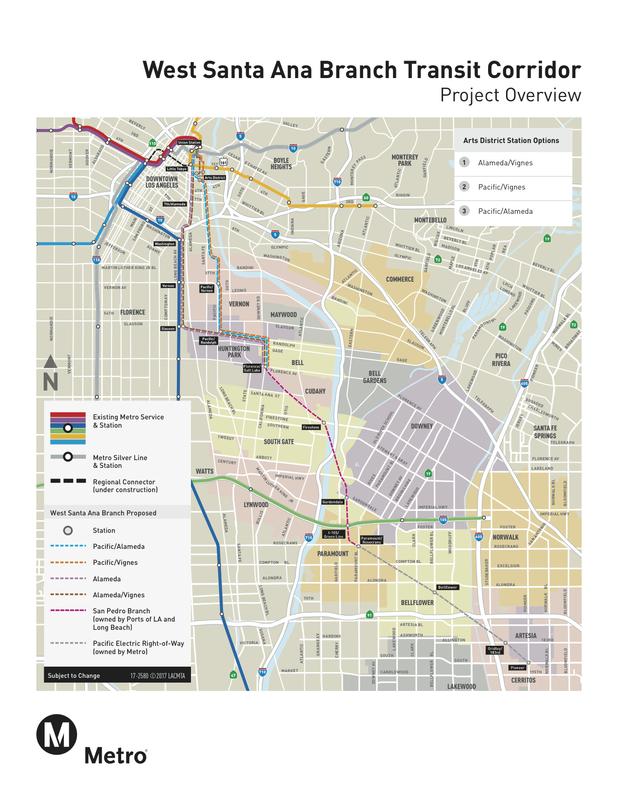 Considering the blue line will be part of the regional connector and sharing tracks there (I think operationally, this will be far more problematic than Metro is letting on). I can’t see how any operations folks would get behind the shared segment: seems like a recipe for never-ending system delays. Maybe of only a couple minutes, but that’s a lot when you’re trying to make transfers or show up on time to just about anything. My understanding is that this project would not use the Blue Line tracks; rather, the new tracks would be alongside the Blue Line. Is there enough room for two additional LRT tracks considering the presence of the Union Pacific (former Southern Pacific-Pacific Electric) freight rail lines? The PE line had four tracks as far south as Watts (103rd Street), but that was then. If there is additional room, then it should be used to provide express service. Alternately, Metro could construct overtake tracks at most stations similar to the arrangement Calrain uses for its Baby Bullet service. I think the environmental studies will determine the best place to put the tracks. If they are placed alongside the Blue Line tracks, there should be crossovers provided, so that in the event that any one track is obstructed, traffic can be diverted around it without having to single-track either line. The Chicago “L” is all third-rail, and is at-grade (but never street-running) in outlying regions (e.g., near the Brookfield Zoo). I honestly don’t know what they do to prevent fatal electrocutions. 600VDC is not a flashlight battery. On the Boston “T,” the Green Line is all trolley; the Red and Orange Lines are all third-rail; the Blue Line is third-rail from Airport to Bowdoin, and overhead between Airport and Wonderland, but that’s at least a matter of winter ice buildup as it is of not being able to safely run third rail at-grade. The Chicago “L” uses barriers (see http://prr4ever.blogspot.com/2007/06/07-06-29-photos-cta-metra-up-west.html} at its grade crossings to inhibit incidental contact with its over-running third rail; The train pick-up shoes are not spring loaded but use only gravity to ensure contact. There are no covers over the Chicago “L” third rail. At one time, some Chicago “L” cars had trolley poles and picked up power from overhead wires but no longer do so. The Long Island Rail Road (LIRR or the L-I-Double R to locals) has numerous grade crossings in over-running third rail territory with very heavy commuter traffic. The pick-up shoes are spring-loaded and there is na insulated cover over the third rail. The LIRR 12-car trains sometimes block crossings during station stops at stations that can accommodate ONLY trains with 10 or fewer cars. There are locations where the gates stay down during station stops even though the train does not physically block the crossing. Metro North also has several grade crossings in it under-running third rail territory. Here a wooden or plastic sheathe prevents incidental contact. In Grand Central Terminal, there are overhead beams in the throat areas to transmit power to locomotive-hauled trains via tiny roof-mounted pantographs where breaks in the third rail could theoretically strand the train. The current dual-mode (diesel and electric) locomotives do not require them as they are long enough to bridge these third rail gaps. However, some FL-9 dual mode units did have these pantographs. Steve Hymon, I understand your role is to rally for what ever ill advised program the MTA puts forth. With that said you have constantly failed to address the issue why the busy and grid locked transit corridor has been ignored from Downtown Los Angeles to Santa Monica via both Sunset and Santa Monica Bl. Santa Monica Bl.’s Line 4 utilizes articulated buses 24/7. Except for Line 204 on Vermont Ave. I do not know of any other lines so equipped. You often brag about your travels on the MTA system. Have you ever commuted during rush hour on either the 2 or 4 Lines? At 8AM in the morning while walking along Santa Monica Bl. near La Cienega one can observe total gridlock westbound with buses as far as one can see two to three within a block on both the Line 4 and 704. And from La Cienega clear to Sepulvada Bl. the old P.E. still exist fully or partially. And unlike many light rail routes being proposed and built both Sunset Bl. and Santa Monica Bl. where no right of way has existed are of sufficient width to accommodate a light rail right of way. Speak up, explain why those on the west side are being ignored. That so called proposal only within West Hollywood is nothing but a joke. It will solve nothing except put a feather in the hats of the five city councel members in West Hollywood. And this proposal is not planed for over thirty years to even begin construction. Look into this problem. Get a official response from the text book boys that have little actual experience in public transit. The silence has been deafening, we need an answer. Sounds like your question would be better of asked at a Metro meeting or on an official public outreach document. Steve writes a blog. That’s his job, not to provide you with solace for your irritations. I agree SaMo Blvd needs to be addressed, but this method doesn’t actually lead you any closer. Thank you Adam. As for SaMo Boulevard, I’m unaware of any proposal from any cities, Metro’s subregions or Metro itself in terms of putting rail along that road. Obviously some of the old rail right-of-way is still there, but much of it has also been developed or paved over. I think it’s fair to say, too, that an extension of the Purple Line has long been seen as the east-west rail option for that area and parts of that line will not be terribly far from parts of Santa Monica Boulevard. A northern extension of the Crenshaw/LAX Line could also serve some of the area if the line comes north and then swings west to a junction/transfer point with the Red Line in Hollywood. Santa Monica Boulevard is obviously a very busy east-west street. It’s one of many busy east-west streets in that area. At this time, they can’t all have rail. Those who want it should, as per usual, contact elected officials or transpo/transit advocacy groups to strategize a campaign for it. Liberal World , Line 20 on Wilshire Bl. does not operate articulated buses 24/7 as does the service on Line 4 on Santa Monica Bl. As a former RTD/MTA Road Supervisor now retired after 30 plus years I’m very aware of where and what type of equipment is used on the west side. ^@fine7760 wilshire blvd is just as “equipped” or more important…………. Steve Hymon, you represent yourself as one of the public representatives at the MTA. You constantly answer questions as to the various proposals being put forth by the MTA. However you seem to shy away from this important question that not only I have asked but from many others. You’re reply that Wilshire Bl. is not that far away and the East – West corridor grid locked Santa Monica Bl. will be served is pure fantasy. Then you state there can’t be rail on every corridor close to one another yet advocate for an additional light rail line sharing the same right of way or a route less than one mile away. Your supposed to be “THE SOURCE” of information to the public. Have you misrepresented yourself as a reliable source of MTA information? Take a stroll to the cubicles that makes these decisions and get us an official answer. Perhaps your question will wake someone up as to why this important corridor that at one time was supposed to be served by a freeway has been overlooked. Liberal World, only the Line 720 uses articulated buses, not Line 20 and the headways are shorter at night on Line 4.